‘Telling Stories’, on the recent films of Duncan Campbell. Review first published in, ‘MAP Magazine’, Issue 15, Autumn 2008. 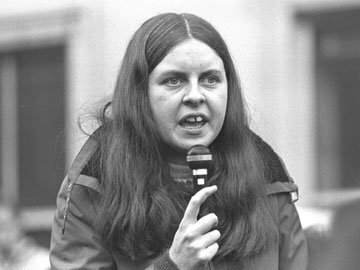 In 1969, Bernadette Devlin, aged 21, became the youngest ever female British MP. One of the student founders of the organisation, People’s Democracy, Devlin won the Mid-Ulster seat in April that year, defeating Anna Forrest, the wife of Ulster Unionist MP George Forrest, who had held the seat from the mid-1950s until his death at the end of 1968. Devlin famously declared that she had been elected by the ‘oppressed people of Ulster’, and took her commitment to social equality to Westminster as an Independent member for her Unity Party. Four months later Devlin was in the middle of the Bogside riots in Derry. For the first time since the partition of Ireland in 1921, the British Army was back. This time the instruction was to separate the Bogsiders from the RUC and the notorious B-Specials in an attempt to calm the situation. Calm it wasn’t. By all accounts Devlin was at that time among hard-line protestors who saw the role of the army as much more than to afford the people of Derry protection. Many commentators place the Battle of Bogside at the beginning of the Troubles, paired in history with the clashes between the RUC and civil rights marchers in Derry on 5 October 1968, which began a marked decline in relations between Nationalists and Loyalists. The 1968 episode is cited by Devlin as her motivation to engage in formal politics, initially on a non-sectarian, non-violence ticket, seeking social justice for the people of Ulster. Forty years after the human heat of those riots, in cool 21st century Switzerland, Dublin-born, Glasgow-based Duncan Campbell wins the annual Baloise Prize for young artists exhibiting his new film ‘Bernadette’, 2008, in the Art Statements section of Art Basel 39. It comprises numerous clips and stills from Belfast City Archives digitally quilted into a 37-minute narrative of Devlin’s political life, including detailed footage of her involvement in the Derry protests. Indebted, of course, to Devlin’s charisma, Campbell’s prize-winning film insists in a disarmingly straightforward way, that political activism, social equality, and utopian politics deserve to keep their place in the collective imaginary; even at an art event which boasts, as part proof of its success, with no irony required, that 205 private jets landed during the 2008 festival. ‘Bernadette’ carries this general hope for justice, notwithstanding periodic heralding by the cultural cognoscenti of a post-historical landscape for art, and frequent reinforcing of our current post-political circumstances, whereby, as some would have it, politicians no longer express commitment to risk-laden political positions à la Devlin, but merely to their (neutral) potential to commit, should ever they feel motivated to do so. Surprising all this gravitas is, then, given that ten years ago Campbell was fresh out of the MFA at the Glasgow School of Art, having mastered that ancient art of fabricating knitted facsimiles of fly posters. Taking inspiration from the visual quirks of slapped-up notices for gigs and clubs found in the art school’s Vic Bar, Campbell submitted patterns of posters to be reproduced by an accomplice with a programmable knitting machine. The result was a series of witty crafty items which rendered the fly strangely more than fleeting. Although a pernicious temptation for the critic quack to weave a connection between two types of distant output, there might credibly be one such in terms of modus operandi. Campbell is confessedly interested in the ways in which an artist can still be just that, while willingly taking primary formal direction from ready-made materials. Accepting that creative authorship is necessarily a triangulated affair, which operates nearly equally inter ‘material’, ‘artist’ and ‘viewer’, he continues in his films what was there with the woollen posters – a sense of conceptual pragmatism: just as the MFA knitting keeps warm a ‘something’ already given to the artist by another, the stitching together of the pre-existent visual elements which comprise ‘Bernadette’ replays the artist’s interest in working, practically, with what’s extant, what’s to hand. Putting to one side the significance of the ‘return’ of the intractable politics of the Troubles; the artist’s homage to the conviction politician of old; and also the grander, and thornier, issue of art as politics (at least for a few paragraphs), this is undeniably a visually powerful film. The force of Devlin’s legendary political will is relayed with great respect and economy, yes, for Devlin delivers without the need for embellishments. But the film is given a singular intensity wholly Campbell’s achievement by virtue of his creative dexterity with the edit. And it is the careful crafting of the artwork which points to a forceful subtext, namely, the significance of Campbell’s self-awareness in his role as storyteller. Campbell acknowledges that he made editorial decisions based on the aesthetic qualities of certain archival materials: Devlin’s clothing in one clip might suggest that a particular clip should follow for visual not historical continuity; the colour tone of another clip might see it placed next to similar or contrasting footage for pictorial reasons, which, in turn excludes another snippet of Devlin’s life, to remain unseen in the archive. His is a compilation not hidebound by objective historical fact, despite the veracity of the component parts of the story. This parallel significance emerges only gradually, through the subtle cuts and transitions between clips, and culminates in an unsettling ten-minute endgame where Campbell separates for the first time the character in shot from the voice being heard. Devlin is still pictured, but disconnected. The new unnamed narrator takes her place in the story, as Devlin’s face dissolves into a pattern on screen. The disembodied voice struggles to reconstruct whatever narrative pertains to her life. ‘A place I principally remember for…’ she states, only to desist a moment after with a resigned, ‘no’. She simply cannot remember. Recollection is incomplete and any normative documentary closure is scotched. The story which is sought here by the eerie ‘I’ of the utterance cannot be fully told. This ‘I’ of the last ten minutes is left only with what is left – what is ‘to hand’ from memory. The expressed frustration by this narrator is highly affecting, and upstages the indomitable Devlin in the closing section. At this level, metaphorically, ‘Bernadette’ is a story about us as fairly forlorn existential entities seeking the narration of a desired narrative, one that brings us into being. It is as much the telling of that political-less story as it is about Bernadette’s political history. Campbell has explored this wonderfully human meta-anxiety equally successfully before. In ‘Falls Burns, Malone Fiddles’, 2003, actor Ewan Bremner voices a narrative of searing existential introspection. Like ‘Bernadette’, the film is a composite of archival footage of Northern Ireland in the 1970s and 1980s, borrowed from the vaults of Belfast Exposed and Community Visual Images. Assorted folks appear in what is ostensibly a pictorial history of urban Ireland at that time. More than that though, as with the dénouement in ‘Bernadette’, the characters and their setting in time and place are transcended if not eclipsed by the interpretative neurosis of the storyteller. Bremner’s doleful character gets to the nub of all this via Campbell’s skilful script: ‘Language being the only attribute proper to me. The only property I’m certain of’, ‘Bremner’ declares, followed by a moment of revelation, ‘but would it not be just as proper to say that I am the property of language?’ Palpably, the protagonist brings himself into being by speaking – it is only his engagement with language which makes him real. ‘I utter nothing, he says, ‘the utterances utter me by my uttering them, I am the utterances, but there is no “them”’. For the existentialist proper, and as Campbell delights, knowledge of anything is always an interpretation and cannot but be anything else. In Nietzsche’s terms, ‘there are no facts, but only interpretations’. This applies equally to self-knowledge. ‘Bremner’ comes to know himself through the speaking out loud of his interpretation of his own coming into being through speaking; there is no ‘Bremner’ which precedes this attempt, or the attempt of others to do the same. He knows he cannot find an existence beyond words, thoughts, noises and images of that which is within his purview. As Gianni Vattimo put it in his essay, ‘The Age of Interpretation’: ‘Things appear to us in the world only because we are in their midst and always already oriented toward seeking a specific meaning for them’. And so we return to the deferred politics in ‘Bernadette’. Campbell’s political message, as my interpretation would have it, is so much more than a pious keeping-alive of gable end characters from a past generation in a bid to counterpoise authentic conviction to contemporary political insincerity. Taking this further, it could be that Campbell sees the Troubles as a fitting backdrop to the Nietzschean maxim of ‘only interpretations’, for today’s politics of courageous conciliation depend on a relinquishing of dogged political and historical ‘fact’ in favour of an anti-essentialist recognition of the plurality of multiple histories. Campbell cannot undo the fact that the Troubles were very much to hand in his native Ireland: that context is as contingently central to his own interpretation of the world as a fly poster is to a knitted one. But from the conceptual pragmatist’s perspective, the visual representation of the Northern Ireland of the 1970s and 1980s in these two films is not only an expression of emotional commitment on the part of the artist to a time and a place. His is not a repeat of essentialist positions against interpretation. Campbell’s is already a mature art of contended frustration with the contingent and partial nature of storytelling, with all its inquisitiveness and necessary incompleteness, and, thus, its maddening peaceableness.